hiiiiiiiiii everyone, kalakirya here! we're heading into the homestretch here with only two weeks left but there's still plenty of time to rummage through the internet for that story that you always really wanted to record. Some leaders are emerging but there's still lots of time for an upset! Before we start, a few stats: we had 46 podficcers this year; 570 podfics were posted, which comes to a total of 502 hours of audio; 48 new fandoms were added to the archive. YOU GUYS. OVER FIVE HUNDRED HOURS. FIVE. HUNDRED. that's nearly twenty-one days! if you listened to podfic 24 hours a day it would take you almost three weeks to listen to all of amplificathon. or, if you actually wanted to sleep for eight of those 24 hours, you could spend ONE ENTIRE MONTH LISTENING TO AMPLIFICATHON. FIVE. HUNDRED. HOURS. WOW. As always, please please PLEASE let us know if anything about your tally doesn't seem right; we want to be sure things are accurate before properly announcing winners. Let us know by end of day next Wednesday (May 20). 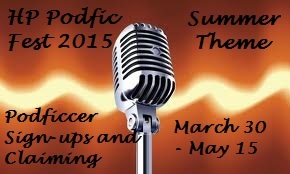 sign up for HP Podfic Fest 2015! Now that the rush of amplificathon is over for another year, you may be asking yourself, "what do I do now?" Answer: COME RECORD FIC IN HARRY POTTER! We are having a Summer theme this year for the first part of posting, then the fest opens to all HP fic. Gen, het, slash, femmeslash -- all are welcome! The clock has struck midnight (Baker Island time), the fairy godmother's enchantments are fading away in puffs of glitter, and your humble mod would like nothing more than to turn back into a pumpkin this morning *yawn*. BUT. Amplificathon 2015 is now officially over! So here's the plan. The final standings post will go up over the weekend. PLEASE let us know if anything seems amiss; we'll allow a week for comments to be sure we're right. The victors will be announced shortly after that. We thank you. Our ears thank you. hi everyone, kalakirya here! we're well into the homestretch, the end is in sight, but the competition is still going! You've got until it is no longer April anywhere in the world - check this clock to know when that is for you! As always, if anything's amiss, please let us know. Thanks! hey guys, kalakirya here! We're two-thirds of the way through, one podficcer short of 40 participants and are hovering around 192 hours of podfic posted *\o/* Keep it going guys, the end is in sight! At least 17 new fandoms and a collective total of 24,525 points among 37 podficcers. You folks have been industrious. Points counting can be a bit like that scene in "Clue" ("one plus two, plus two, plus one ..."), so as always, if you have any questions or corrections, do let us know. Hi everyone! kalakirya here with the week two totals and standings! hey guys! this is a gentle reminder to please make sure to use the "!not archived" and "amplificathon:2015" tags. It makes archivists' and mods' work much, much easier! jesperanda here with the standings for the first week of Amplificathon 2015. So far, we have about 75 new podfics and at least 4 new fandoms, including Jupiter Ascending with 11 (!) podfics so far. So while I'm rolling around in all the new podfic, here are the results as of 10:39 p.m. EST March 21 (UTC -4). We mods do our best to be accurate, but if you think your total should be different, please let us know. amplificathon 2015: and we're off! it's march 15 somewhere in the world. we'll accept submissions until it is no longer april 30 anywhere in the world. need to know how much time is left? this clock will tell you. Anything not appearing on these lists qualifies as under-represented, meaning that there were 20 or fewer podfics in the archive for that fandom, relationship, or gen category on March 1, 2015. This includes both categories with zero podfics and categories with 20 podfics, and everything in-between. here's where you can comment with your podfic if you don't have a dreamwidth account. we'll reply to your comment to acknowledge it's been counted. podmod - amplificathon 2015: final standings! starduchess - sign up for HP Podfic Fest 2015! podmod - amplificathon 2015: and we're off!